GY’s close buddy 闺蜜 PY is in town for 2 weeks. this time i was away on family holiday for 2 weeks+ in sep, so arranged to have one dinner at my house & one outside with OPs bros, GY & PF. claypost rice my usual, very flavourful, rice texture & moisture just right. 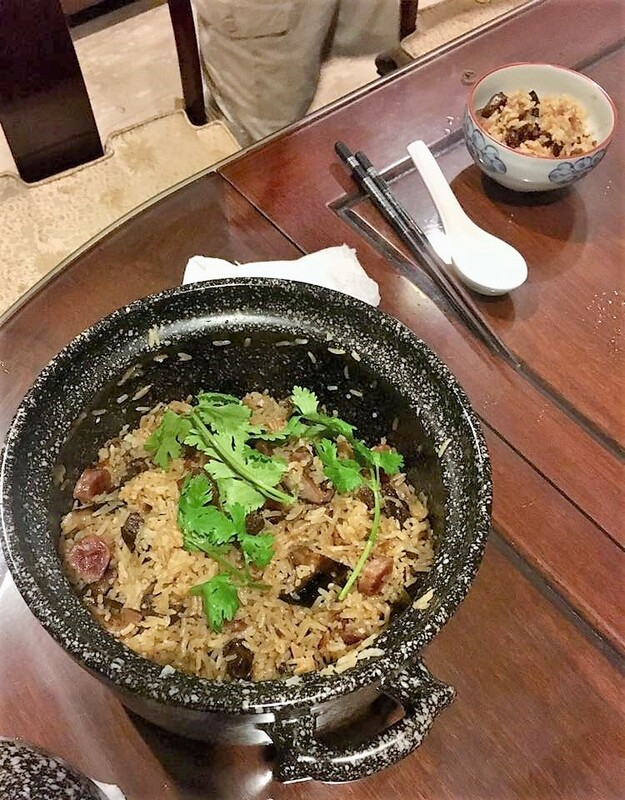 only adjustment was since i not adding chicken to the claypot rice, to make the rice more tasty other than having the flavourful sausage, i used intense chicken stock boiled from chicken bones & a bit more of salted fish. i did not add salt. 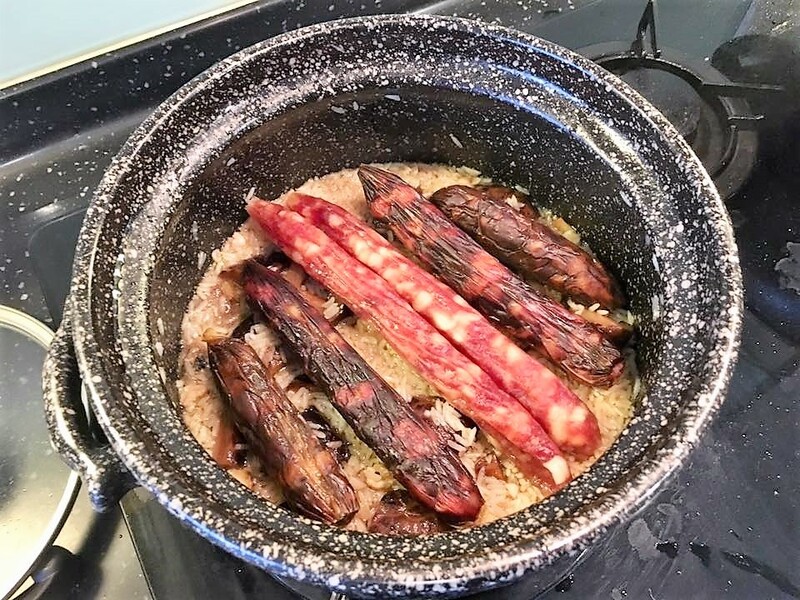 i cooked 2 cups for 6pax. it was enough. we all don’t take too much carbs. both the 口水鸡和 醉鸡 saliva chicken & drunken chicken were very tasty & texture of the kampung chicken excellent. my friend finished the drunken chicken & only 2 wingstick of the saliva chicken left so they were well received. anyhow i decided to make 1/2 口水鸡saliva chicken & 1/2drunken chicken 醉鸡 so i used the chicken rice poached method & added the sauce. 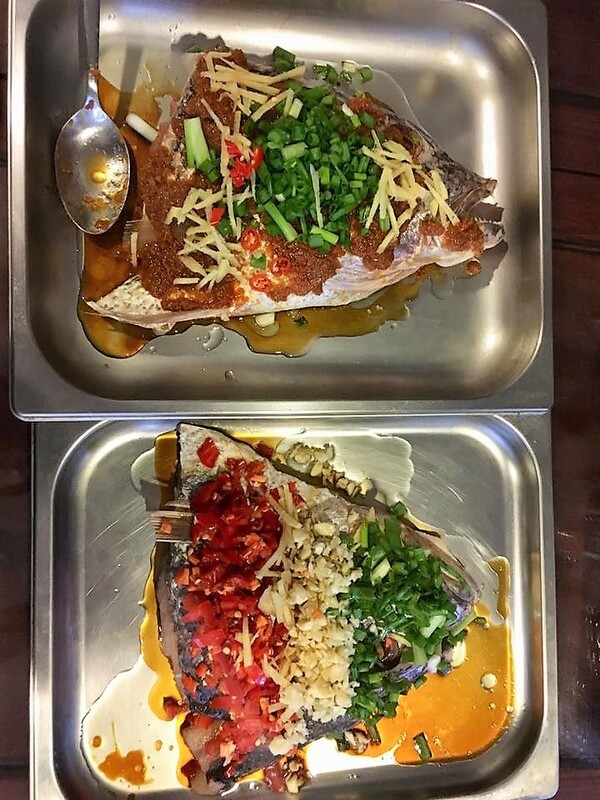 WT caught a 3.5kg/4kg red snapper 1 month ago, and chopped into 3 portions for me. 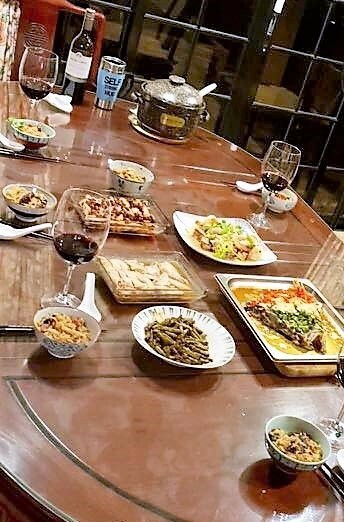 we were finding an occasion to have a fishy dinner 全鱼宴. couldn’t really do that with just 6pax so i cooked only the fish head…still a big problem for me to chope the fishe head in 1/2. 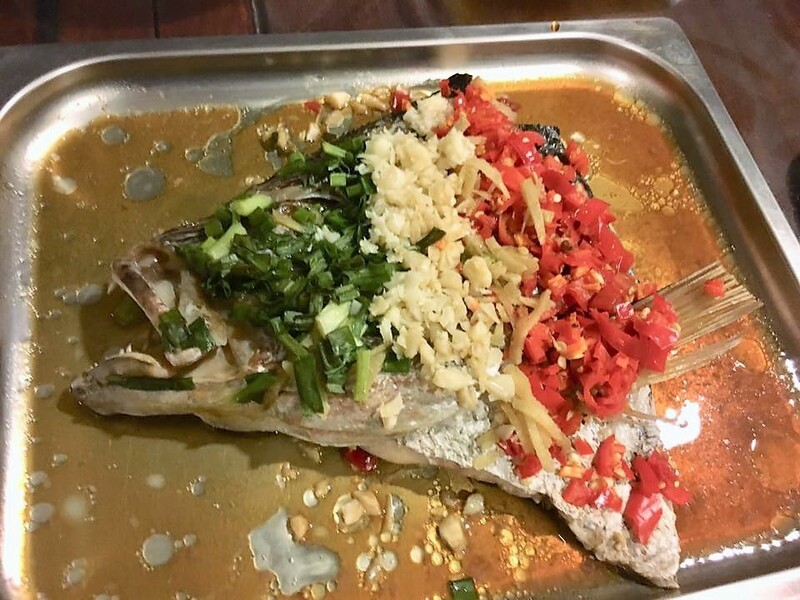 the steamed red snapper head with chilli & garlic 剁椒鱼头 was quite competent, so they all liked it. its the smaller 1/2 so i steamed for 10mins. meat texture quite perfect & basically it was the top quality light soy sauce that did the trick, bring out great flavours. 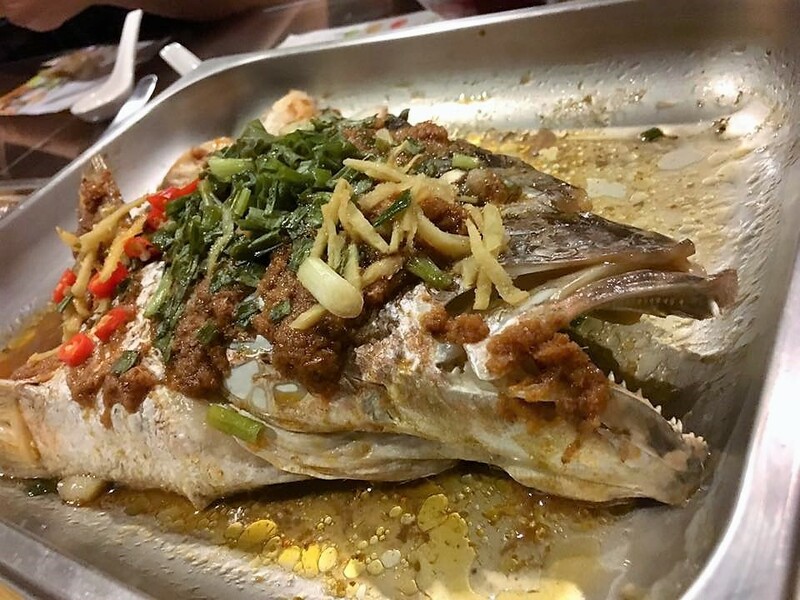 the nonya steamed red snapper head 娘惹红雕鱼头 was even better tasting with the tangy sauce, and something new for PF. my friends finished most of the 2 fish heads. 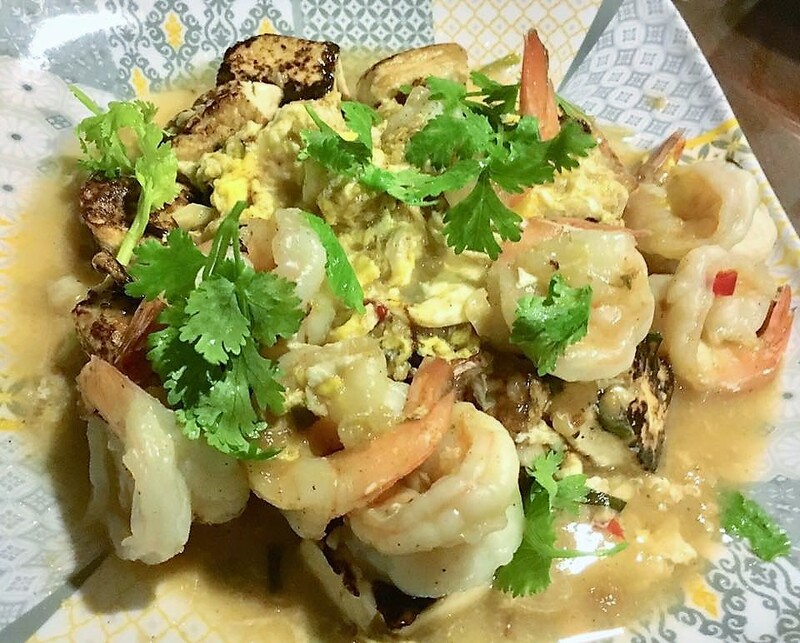 the prawn tofu was ok. i have done better. today the fried tofu not that good, not done well. otherwise it was ok and the dish was cleared out. 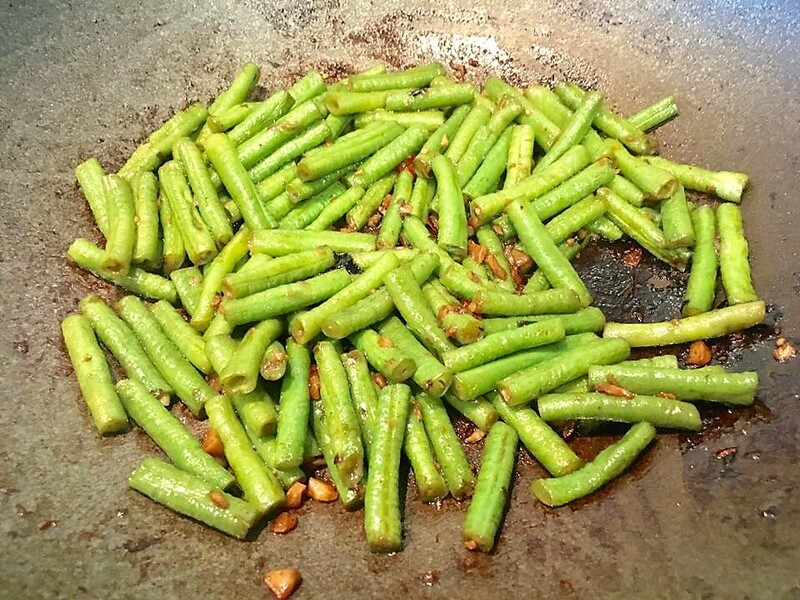 my fried long beans didn’t look great. but taste was pretty good, with oyster sauce and a bit of mala chilli. the dish all finished too. for the preparations, i fried chicken fat & ginger, off fire & added 3tsp chopped garlic and 2 slices of salted fish & fried in the residual heat. then added 2 cups rice, 5 thick chinese mushrooms quarterred, fried & added 2 cups intense chicken stock & set aside. & time it to cook about 20-25mins ready for dinner at 7pm. 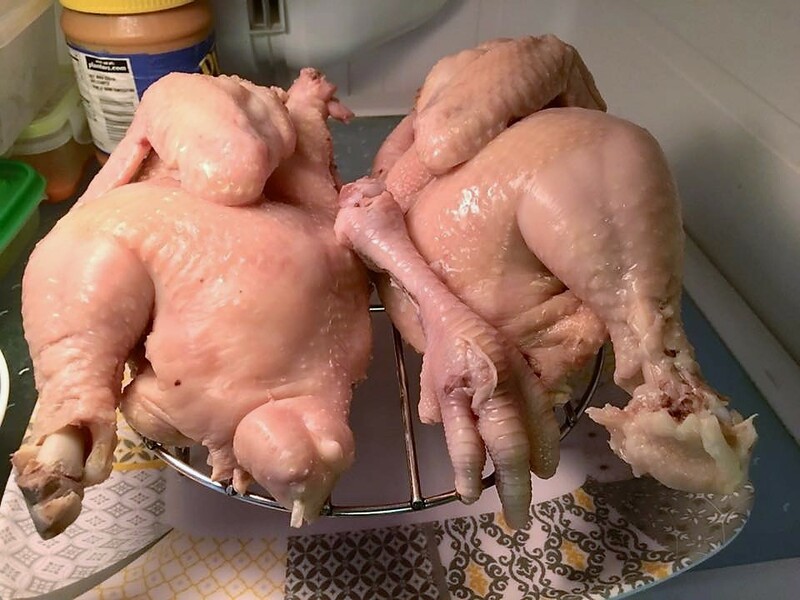 i salted the kampung chicken overnight in fridge. 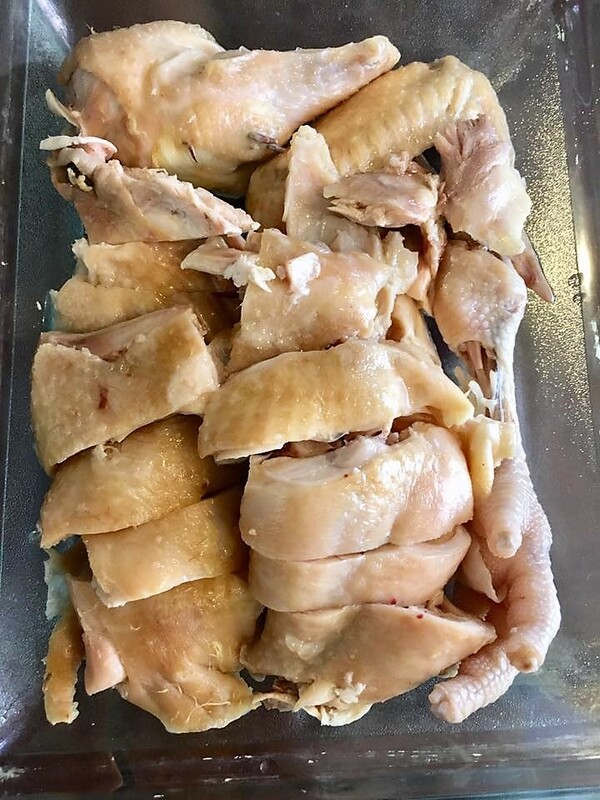 first time i did poached chicken method for kampung chicken 1.1kg (usually 1.4kg-1.6kg battery chicken). so i reduced 12 minutes boiling to 9mins & poached in the boiled wtaer for 20mins instead of 25mins. then plunged in ice bath. for the saliva chicken, i added 2tbsp mala chilli sauce, 1 tbsp fish sauce, 1tbsp sesame oil, 2tsp sugar and tasted. it was quite perfect. i added to the 1/2 debone chicken & covered with clingwrap in fridge. 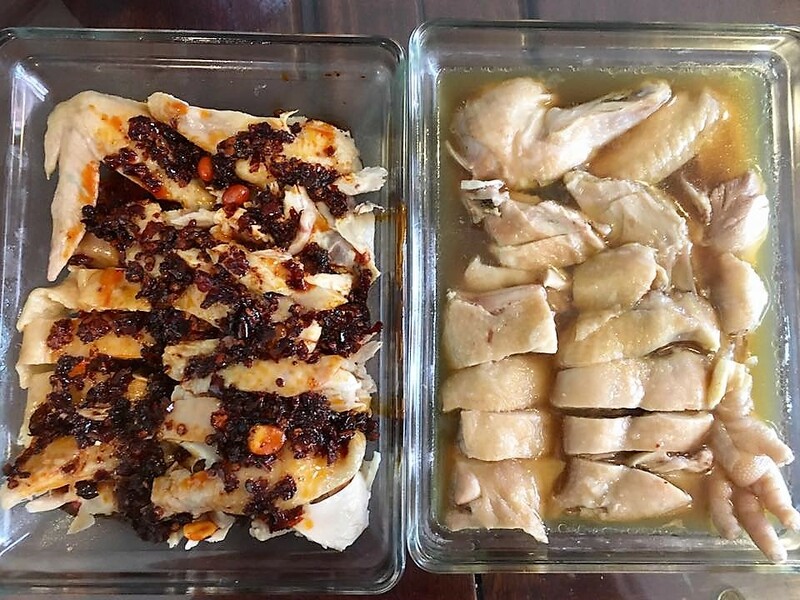 for drunken chicken i added 1/2 cup hua diao jiu, 1 cup chicken stock, 1.5 tbsp fish sauce & 1tsp sugar. 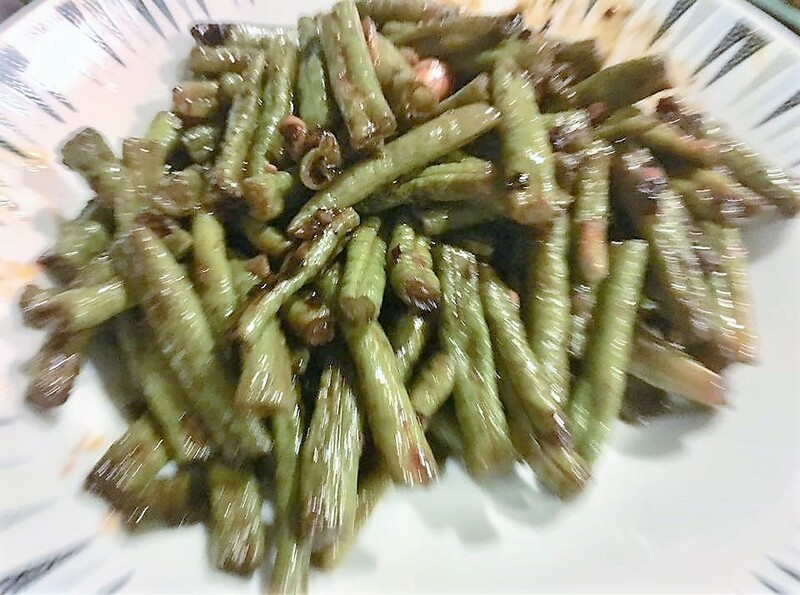 the fish heads were the usual – basically 2-3 tbsp light soy sauce, 2 tbsp mirin, 2tbsp olive oil. and for the nonya style, 2 tbsp gimson nonya sauce. today fried tofu not good. 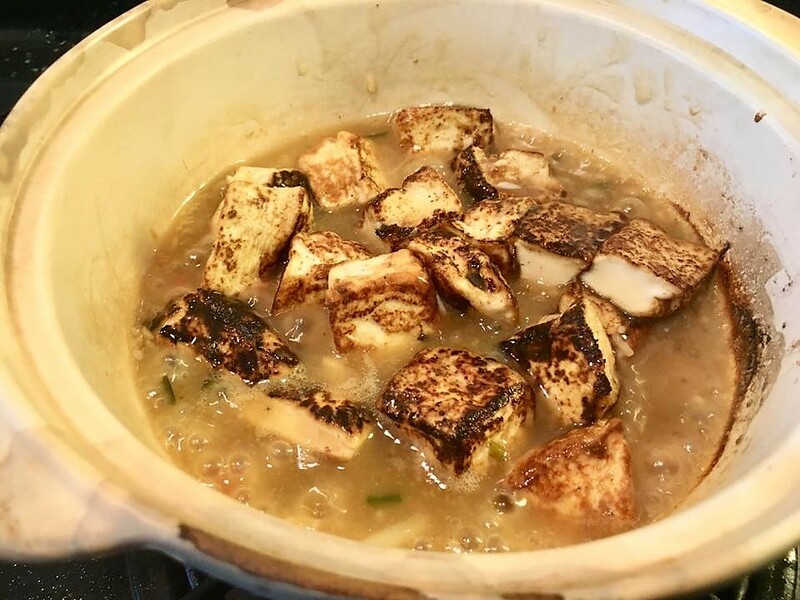 had to change non stick pan a my usual one losing non stick property…texture of tofu not ideal after frying twice. chicken stock & gravy was ok. so taste was ok.
i did the long beans a bit earlier as i did not want to rush when guest were here. but it became a bit old (earlier photo) when i reheat. luckily taste was ok.
was a fun dinner entertaining good friends & spending a wonderful evening together. WT brought a very sweet pomelo from SKC. we had that & did a bit of karaoke in the room after dinner.